DUMBARTON grabbed an important point thanks to a stunning late revival against Raith Rovers at the Cheaper Insurance Direct Stadium. 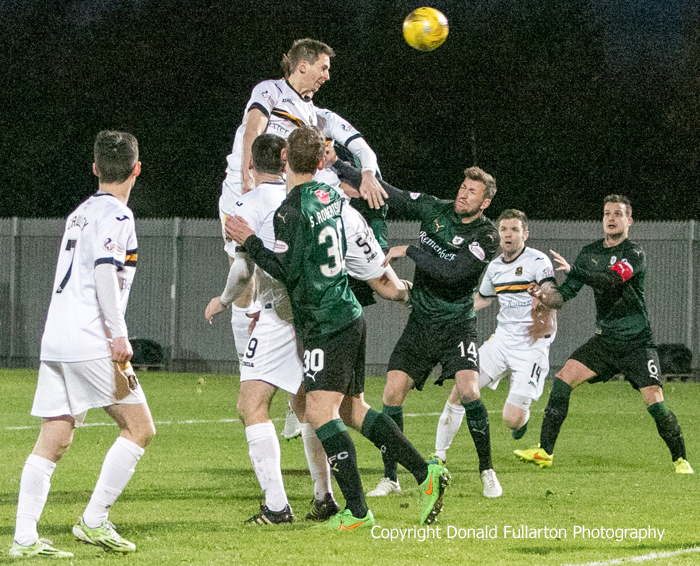 DUMBARTON grabbed an important point thanks to a stunning late revival against Raith Rovers at the Cheaper Insurance Direct Stadium in front of a crowd which started at 707, but decreased early in the second half. Ray McKinnon's full-timers controlled the first period as Sons failed to create any real chances in front of goal, while their usual defensive lapses allowed the visitors to go 2-0 up through James Craigen and Mark Stewart. Raith's third goal in the 56th minute from Scott Robertson sparked a walkout by some of the Sons supporters — and how they must have regretted it later. Three down with six minutes left, Sons staged an astonishing comeback. Full back Stevie Saunders headed home two corners in two minutes, then the home side were awarded a penalty for handball which Garry Fleming despatched into the net. They could even have snatched a highly unlikely victory as a curling shot from Willie Gibson hit the post and bounced out. The picture shows Saunders heading his first goal.